It’s about that time for holiday parties galore, and for that, you need a dip! If I’m invited to your gathering, this is definitely the one I’m bringing. I take my appetizers seriously. 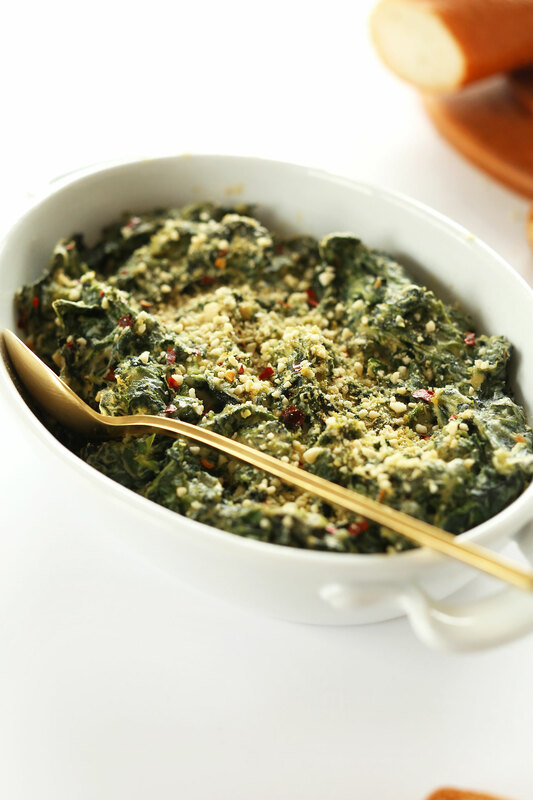 This cheesy kale and spinach dip is my vegan take on classic spinach and artichoke dip, which is typically laden with cheese – my former love. But since we’ve broken up, I’ve replaced the cheese-shaped hole in my heart with cashew cream and vegan parmesan and haven’t looked back. Who needs the real thing when the substitutes are healthier and taste amazing? That’s what I say. This dip requires just 9 ingredients – hooray! And it comes together in about 30 minutes (once your cashews are soaked). All that’s missing is a toasty baguette for scooping. Don’t worry – we’ll get to that. Once you’ve mixed your ingredients together it just takes a quick bake in the oven to get it piping hot and ready for serving. I preferred a toasted baguette, but you could also serve it with veggies, tortilla chips, or any other crackers of choice. If you make this dip, we hope you love it! As always, share a picture on Instagram with the #minimalistbaker if you do! We’d love to see this dip in action. 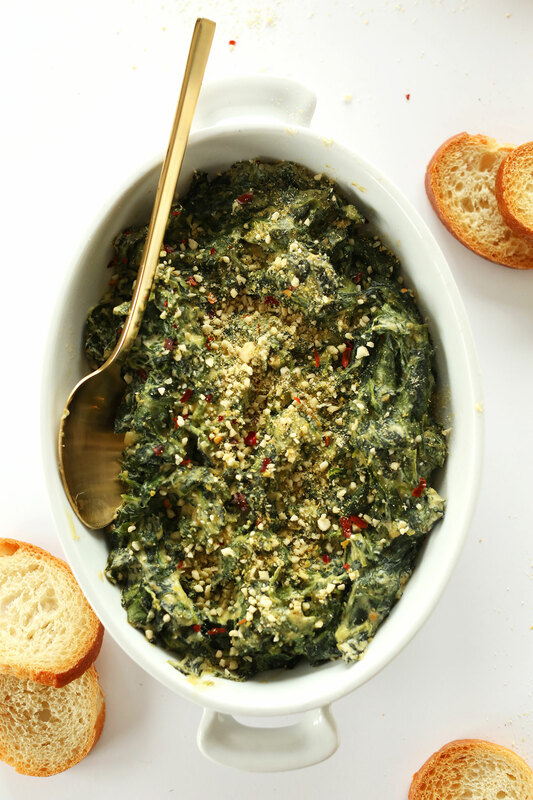 Simple vegan spinach and kale dip made with just 9 ingredients that will please a crowd. Cheesy, hearty, chock full of greens and so delicious. Perfect for holiday parties and beyond. If you haven’t soaked your cashews yet, do so the night before in room temperature water, or 1 hour before in very hot water. Drain thoroughly. Preheat oven to 350 degrees F (176 C) and lightly grease a small, oven-safe serving dish (see photo for size reference). Add soaked and drained cashews to a blender with almond milk and puree into a cream. Add 1/4 cup nutritional yeast and 3/4 tsp sea salt (amounts as original recipe is written // adjust if altering batch size) and mix once more. Taste and adjust seasonings as needed. You want it pretty cheesy and well-salted, so I added the full 6 Tbsp nutritional yeast (amount as original recipe is written // adjust if altering batch size). Set aside. In a large skillet over medium heat, sauté garlic in 1 Tbsp olive oil (amount as original recipe is written // adjust if altering batch size) and then add spinach and kale. Season with a healthy pinch (1/4 tsp as original recipe is written // adjust if altering batch size) of sea salt and black pepper and cook for 5 minutes or until wilted, then remove from heat. Add 3/4 of the cashew cream (see photo) and toss to combine. If it can take more, add it in. Otherwise, reserve the rest for pasta or other uses. Add 2 Tbsp vegan parmesan cheese for additional texture/flavor and stir. Add to prepared baking dish and top with remaining vegan parmesan. Bake for 15-20 minutes, or until warmed through and sightly browned on top. Before serving, top with additional vegan parmesan cheese if desired. Other add-ons might include red pepper flake or hemp seeds. Serve with assorted vegetables, tortilla chips, crackers, or toasted baguette. Store leftovers covered in the fridge for up to a few days, though best when fresh. Made this for a girls cottage weekend. Pre-made the night before and then baked at the cottage. So delicious. Served with crackers, crudités and champagne! I doubled the recipe and squeezed fresh lemon juice on after baking. Yay! We’re glad to hear that, Kate! Made this for Xmas and everyone loved it! I would definitely double the batch next time because it did not make as much as I thought it would! Served it with a Toasted Baguette and it was wonderful! Will definitely make again! Great! Thanks for sharing, Maura! Loved this recipe! Made it for Thanksgiving and my very picky dairy loving family actually enjoyed it!! Yay! Thanks for sharing, Martha! Next time would you mind leaving a rating with your review? It’s super helpful for us and other readers. xo! oh yes sorry! thought i did but must have hit it too late! Def. 5 stars! I was surprised by how amazing this dip tasted even non-vegans were fans!! I will definitely make it again in the future! Oh my goodness, I’m so happy I found this recipe! I love spinach dip but it’s too heavy for my lactose intolerant stomach. I just made this cashew/nutritional yeast version and it is just divine 😍 Creamy, cheesy, healthy… it’s sooooo tasty!! I wanted to make it right away so boiled the cashews, next time, I’ll try soaking them overnight to see if there’s a difference. Have made this so many times and it never disappoints. 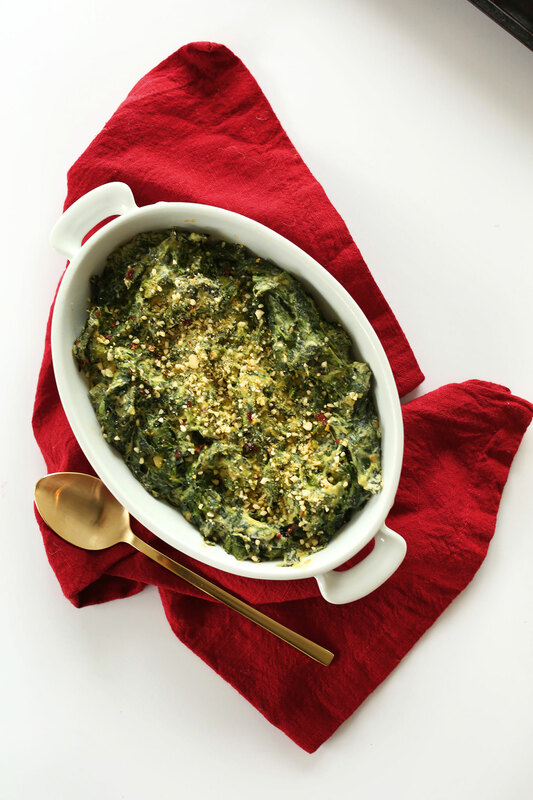 I knew you’d have a delicious creamy spinach dip recipe – thank you for always coming through! I can’t wait to make this for an upcoming party I’m attending. Being the only vegan among my friends, I always want to open people’s eyes to how amazing vegan food is and how you’re not giving up anything by being vegan. I’ll let you know how it turns out! I have recently been having food allergies to cashews and was wondering if I could substitute tofu? I subbed out tofu before for cashews in another recipe of yours and was wondering could I do the same here? Made this last night as an appetizer before dinner with friends, and everyone was raving about it – including me (hellooo, easy)! My husband and I agreed that this is our new staple to bring to parties. It tastes so decadent, no one could believe there was no dairy in it. We love recipes that help make our friends realize how delicious vegan food can be! Thank you for this gem! I would not recommend using pistachios in place of cashews, but don’t have another sub for you at this time! Suggestions for subbing for cashews? I have a tree nut allergy. Thanks! Do you think I could freeze this dip well? I wouldn’t recommend it! Store leftovers covered in the fridge for up to a few days, though best when fresh. 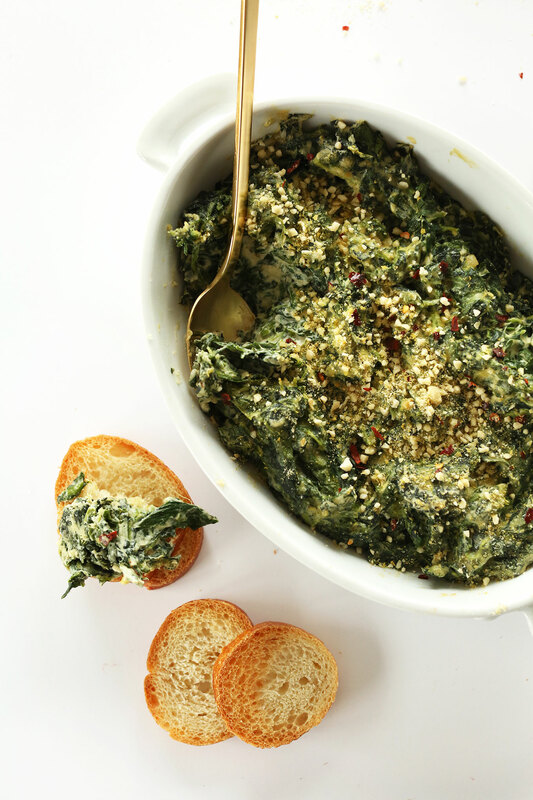 Just made this recipe for a party, but subbed the kale with artichokes (to make it more like a spinach artichoke dip). Everyone loved it and no one would have guessed that it’s dairy free. Highly recommend! Hi, love your work, the website, the book, everything! I have been looking at making a cob loaf and was wondering would it work if I made this dip ahead, then spooned into the cob later? I was hoping to have the dip made a few days in advance, do you think it would keep that long and would it taste fine served cold as opposed to warm from the oven? Hmm, not sure! Don’t know what a cob loaf is. But if you try it let me know how it goes! Just made this, and overall I love it. Crramy, cheesy, delicious. It tastes absolutely decadent, like I should feel really guilty indulging. However, it was very very salty. I don’t know if maybe I over salted the cream part or the sauteed spinach or what. Impossible to eat with chips, it was tolerable when paired with veggies. But I’ll be much more careful with the salt in the future. My best friends and I, do wine night every thursday with a delicious spinach dip recipe her mom thaught one of my friends. We love it but we don’t know how to cut down the calories, and I think this is a great solution! I’ve never cooked anything vegan but since I watched NikkiLimo on Youtube she talked about your blog and I think it’s GREAT! I may just start! I just picked up a ton of fresh spinach. Should I steam, or saute? And how much should I use? Hoping to try this on Sunday. Hi, this sounds amazing. Unfortunately I cannot have cashews and I saw you also suggested Eggplant, but I can’t have that either. I can eat other types of nuts, wondering if any would work, like Walnuts or Almonds, or any other suggestions? Thank you. I want to make this for Christmas, but I’m pressed for time. Do you think it would still be good if I did everything up to baking it the night before? I thought maybe I’d take it with me the next day and then sprinkle the parm and bake it after I got to my parent’s house…. My stomach is growling looking at the pictures-hope I can wait until then! Yum! I love each of the ingredients in this dip on their own, and they don’t disappoint when combined! It felt rich and decadent, but I knew that it was secretly healthy (and perfect for a vegan with insulin problems!). Total winner. I made this as a side dish for thanksgiving and it was my favorite part of the meal. Amazing recipe! Thank you! Amazing dip. Seriously impressed with this recipe! Hi Dana! Do you think I could sub coconut milk for almond milk in this recipe? I don’t think so. Perhaps rice milk? Hello—I made the dip tonight for my GF (who’s vegan)…I did notice my cashews and almond milk did not turn out as “creamy looking” as yours…despite the fact that I added extra almond milk and processed it to the end of time lol…my sauce was a little “nuttier looking…I made some homemade vegan garlic bread for dipping so I am hoping she likes it still! I love your site…thank you for taking the time to share your gifts!!! Hi! This looks delicious, I want to make it. Just one question: Do I have to bake it? I mean, does it really make a difference or is it ok if I serve it straight out of the pan? Thanks! Does it matter of you use fresh spinach over frozen? Nope! It shouldn’t. Just finely chop it. This was the recipe that is responsible for me discovering you & your amazing site. Whoa! This was our New Years appetizer. Holy moly!! I wouldn’t change a thing & I’ll be making it again. And again. And then again. Bravo! 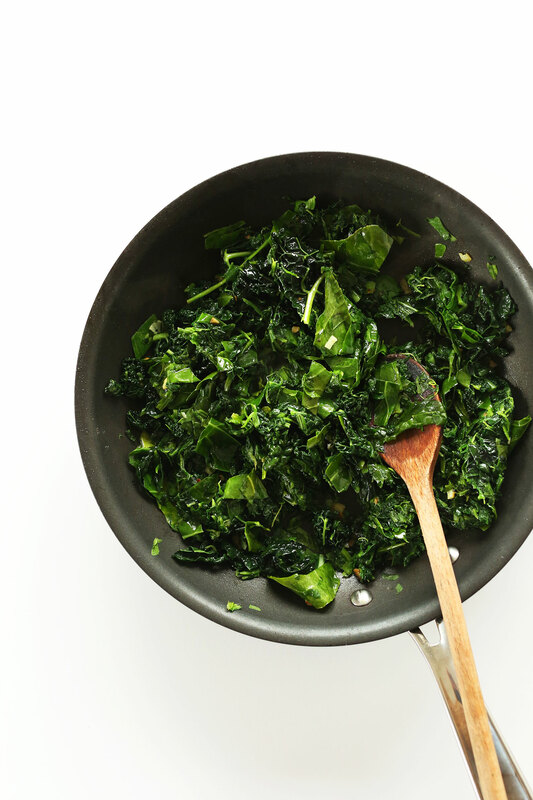 Do you know how much cooked kale this recipe would call for? I cooked all of my kale yesterday and this would be perfect to use it up, but I think 3 cups cooked will turn out to be a lot more then 3 cups uncooked (as in this recipe). I felt lazy so threw it together with two packs of frozen spinach. Didn’t sautee anything, just put garlic in raw. It was absolutely amazing! This looks amazing! Do you have any idea on what I could use for “cheese” if I can’t use nuts? someone in my family has a nut allergy. Eggplant! See the general recipe here. These knocked the socks off of my whole extended family and none of them are vegan!! They love their cheese and didn’t miss it a bit! Even my “I will not eat anything healthy.” sister said she loved it (before she found out it was vegan). yay! thanks for sharing, Jess! Another winner!!! I made it as a side dish instead of a dip so only used little more than half of the cashew cream. This will be made again and again and again! There hasn’t been a single recipe I’ve tried from your site that I have not loved! Thank you!!! If you’re going to make this, double it! So D E L I C I O U S! Whoops, was trying to delete my first comment since I figured it out (the key was in step 4!). If some moderator reads this, please delete this comment and my first one! Thank you! Just discovered your blog but love all the recipes! I bookmarked 6 or 7 immediately and am trying this one (my first from your site!) tonight. I’m making this for company tomorrow and hope it turns out great! Just discovered your blog but love all the recipes! I bookmarked 6 or 7 immediately and am trying this one (my first from your site!) tonight. One point of clarification – this might be obvious to everyone but – the kale should be cooked, right? I got the chopped frozen spinach and while it’s thawing was going to cut up my bunches of fresh kale but then realized that you probably meant cooked first, yes? Sorry for the maybe-obvious question but I’m making this for company tomorrow and want it to turn out great! I am going to try this as a pizza topping. Can’t. Wait. For. Pizza. Night. Sinful! My 18 month old was eating the cashew cream out of the blender… Just amazing! Made this the day after Christmas and I wished I made a double batch! My husband and I practically ate the whole thing before it was cooled…planning to make it for our New Year’s day get together. Awesome, must try dish. Yummy, what a great dip! it’s difficult to find nutritional yeast in our part of the world so… can i skip it or sub it with something else? :) thanks!!! Making this right now for a Christmas appetizer! So excited to try it…I also added in some chopped artichokes, hoping it will be delish! I had always been so intimidated by making cashew cream and I am so glad I made this recipe! I honestly wish I had some with me right now for breakfast. It is just that good! Yay!! So glad you enjoyed it, Megan! This sounds sooo great!! I definitely have to give it a try!! You guys seriously! EVERY RECIPE IS AMAZING! My bf found about your blog about a month ago, when he was looking for a vegan hot chocolate recipe. From that day we have cooked around 6 recipes already (in repeat… almost by memory now) and its just so simple and amazing. I check the site everyday and keep adding recipes to my to do list. Thank you so much for all you do and making our tummys happy with delicious simple vegan recipes. Ah, yay! So kind! Thanks for sharing, Maria. So glad we can keep your bellies full and happy! Do you think you could prepare this all the way up to getting it in the baking dish, and then refrigerate to bake just before serving? This looks soooo awesome, but will be an easier holiday dish if I can do most of the preparation in advance. Thanks!!! This sounds divine! We do a big appetizer spread for Christmas Eve–I may have to add this dish to the mix! This sounds incredible, I think I’ll be making this soon! 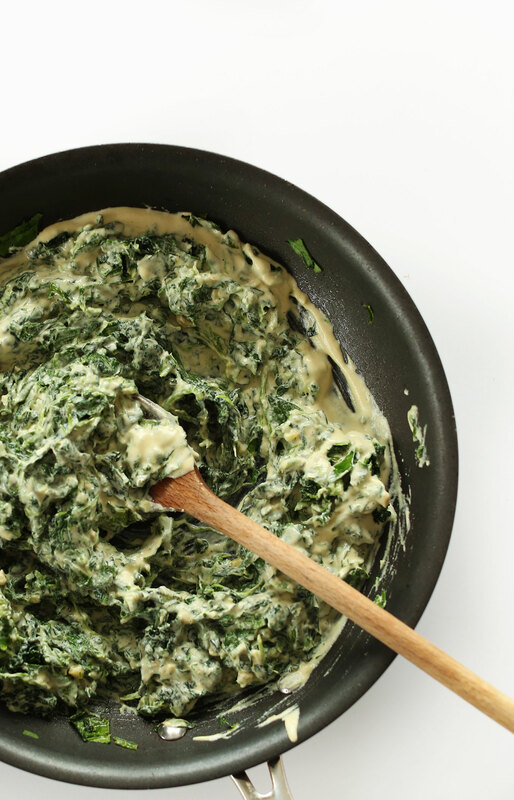 I’m with you — spinach and artichoke dip is da bommb, but I hate to pass it up because of dairy allergies. And bringing kale into the mix? Oh yeah, brilliant decision right there. This dip looks so creamy and incredible! Aaack, somebody get me a holiday party so I don’t devour the entire bowl. I love all the recipes I have tried from your site. It makes being vegan easy and delicious! I have a questions – I am bringing cupcakes to my daughters ballet tea party this Friday and I wanted your opinion on what frosting to use. I want it to look like a swirled candy cane and I plan to use a piping bag. Do you recommend doing the coconut whip, regular vegan icing (like you used for the pumpkin cookies – minus pumpkin) or the vegan buttercream frosting. I’d recommend a vegan buttercream icing (which is basically what I used for the pumpkin cookies). Hope it works out, and thanks for the kind words, Carey! I am definitely making this one Dana! I love the classic Spinach and Articoke dip, but haven’t eaten dairy in about a year due to sensitivities. Seriously can’t wait to give this a try! I take appetizer seriously too! This is perfect for next week! Dang. I’ve only recently discovered you guys, but I think I’ve already bookmarked 20 recipes. Keep the goods comin’! Love how simple everything is. haha! Love it. How did you find us, Melissa? Another blogger had linked to you and the recipe looked great, so I kept coming back! I think it was on Real Life RD. Oh great. Thanks for sharing, Melissa! 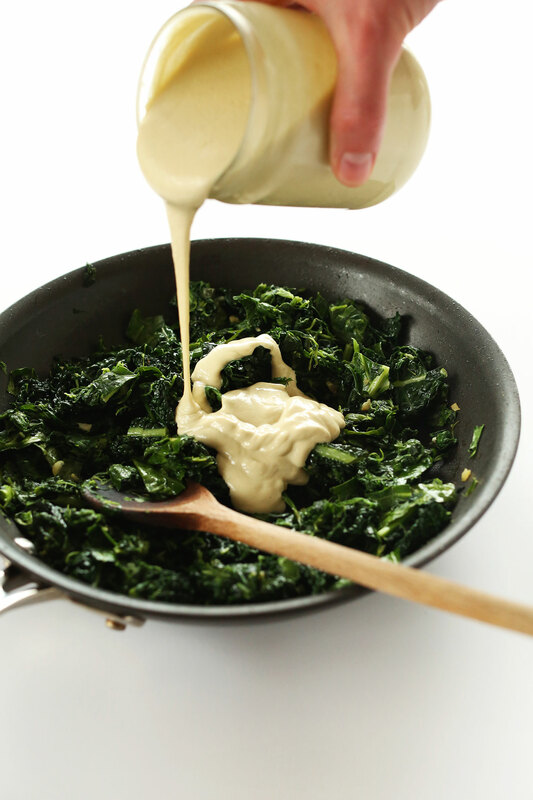 Kale is a tough green for a 2-year-old to chew on but I think my daughter would gobble up this creamy dip. 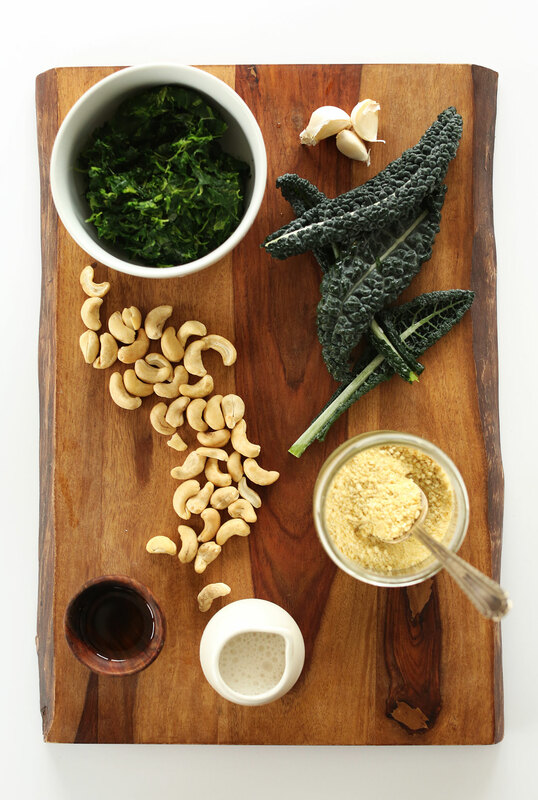 And the garlic and the cashew cream… We will gobble it up together. Yes! The cooking and baking in a creamy sauce makes it oh-so tender. Hope she loves it! 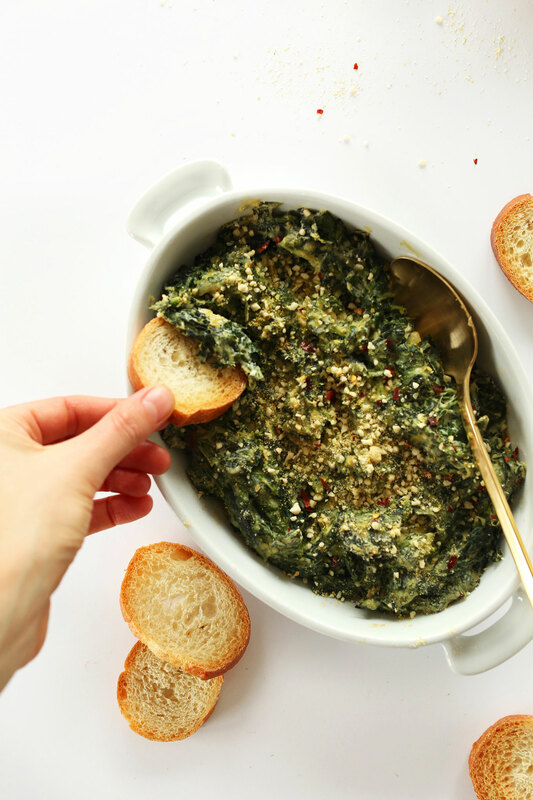 I love a good spinach dip and this one looks so good and so much healthier than the typical versions, plus the additional of kale, super yum. I’m also having a foodie love affair with cashew cream lately, so thanks for another recipe to add to my new love collection! Mmm, cashew cream. My love affair with that stuff will never stop. Hope you love this one, Jen! Now THIS recipe is what dreams are made of!! 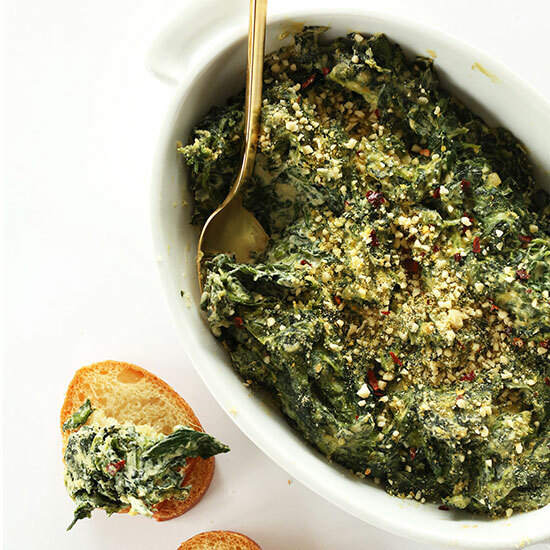 I love creamy spinach dips but never eat them but this one I am now dying to try!! Great work! Thanks Marla! Hope you love it! I love creamy spinach dip, but I never eat it, because of all the cheese and cream. This would be a perfect healthy alternative! Can’t wait to try it out! I thought the same! Hope you love it, Jenna!